Know the best glue for shoes to make a DIY repair – At some point in time, everyone has suffered from a pair of shoes that has eventually broken due to regular usage. You may seem to get frustrated with that pair of your broken heels and don’t know what to do! It is typical for shoes and heels to get damaged due to regular use, despite how carefully you handle them. Sometimes you may feel like throwing them in the trash; however, you may try a shoe repairing shop first. The shoe cobbler may fix your boots with the best glue for shoes, which will increase the lifespan of your favorite shoes. Fixing your shoes from a shoe repairing shop may cost you a lot amount of money. The amount of money that a shoe repairer charges for one time may buy you at least three sets of super shoe glue tubes. So, why pay money for a shoe repair if you can do it all on your own at home! If you are wondering about the finishing that glues give to your shoes, then there are few super-types of glue that will attach your shoes like a professional! Urethane rubber: best used on soles that are damaged or separated. It resists heat and does not stiffen on usage. Neoprene cement: this material is used on almost all types of surfaces including fabrics and synthetics. Super glue: this type of glue bonds permanently and quickly as compared to any other kind of glue. However, you must wear a pair of gloves before using the product. Epoxy glue: this glue is typically used to stick metals and craft materials. 0.1 What Glue Do Cobblers Use? 1.1 The best shoe glue available in the market which you may use for DIY repairs. 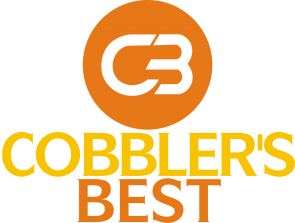 Cobblers use adhesives which are both robust and elastic when ensured. They utilize a glue which is water and temperature resistant and can bond firmly into the sole of your shoe. There’s not a single major glue that’s utilized, cobblers can use unique adhesives for various difficulties. Before restoring your shoes, you must remember to pick waterproof shoe repair adhesive that keeps the soles stuck for a more extended period. Shoes are open to the wet and dusty surface; water resistance repair glue helps the sole to remain intact. Always remember to clean the surface of the sole and the shoes before applying glue. Use some sandpaper in case there is dust accumulation on the heels or base of the shoe. Stick bath the ends and keep pressing until it is a little dry. Wipe away any extra glue that oozes out. Keep the shoe part under a heavyweight to keep it intact. Let it dry for at least one hour before using. The best shoe glue available in the market which you may use for DIY repairs. Freesole Shoe Boot and Repair adhesive is urethane glue that works great to stick your wetsuit booties, flip-flops, and hiking boots. It is the great glue that gives a pro finish to your shoes. Which permanently attaches the soles of your shoes and worn out parts. It also connects toe caps, worn out band and boots. A good pair of shoes withstand a lot of rigorous wear and tear due to regular use. Freesole Shoe adhesive works hard to give permanent repairs to the favorite pair of boots and flip-flops. Patented urethane rubber repair glue. The heavy-duty formula is tough and permanent. The free sale of shoe glue provides tremendous attachment. It is highly resistant to abrasion and dust. Reattaches all types of rubber, steel, and plastic soles and is highly durable. The glue remains unaffected in temperature ranging from -20F to 200F. It can be used to create double toe caps and adding abrasion resistance to your shoes. Available in clear and black color that gives a matching effect to all your shoes. Pretty easy to use and keeps your soles and heels intact for a longer time. It is durable, flexible and shock absorbing. It dries very fast. Thus, you need to be real quick in attaching the soles. In case there are dust remainders in the sole, it will not work. Once used, you need to store them in a tight cap, else you will at a lose. You need to put it in warm water for reusing the same glue pack. The product seeps through the smallest holes due to the watery texture. Shoe goo repair adhesive is a shoe repair glue that gives a permanent solution to the damage caused by your favorite set of pairs. It is a brand of resin that results in repairs of athletic shoes, skate roller shoes, and tennis footwear. Whether your boots have cracks or there are tears in your canvas, Shoe goo is a suitable adhesive to repair all pairs of shoes. It is a sealant designed for the maintenance of your favorite shoes. Shoe goo is incredible stuff that can attach a small potato head as well. Used as a layer of Vaseline on the surface is enough to stick any surface. The glue is used as a putty with the help of a knife and sticks in 72 hours. Bonds and repairs the shoes permanently. It gives a waterproof coating to the torn part of the shoes. Shoe repair glue that repairs all types of leather, canvas and vinyl shoes. It works as an excellent sealant. It is like rubber in a tube that adheres all the shoe repair problem. Unique formula designed for abrasion resistance and adhesion. Perfect for fixing worn soles or damaged shoes. 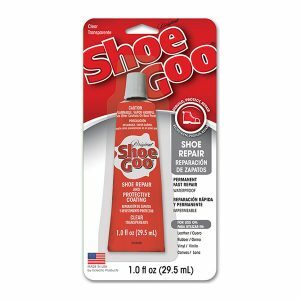 Shoe Goo repairs all the heel, rubber and leather shoes without any hassle. It is a small tube which is pocket-friendly and works like a magic potion. Gives a waterproof coating to the shoes where it is broken or cracked. Creates traction and repairs the shoes permanently. Can be used to secure skateboard damage as well. Comes in a small tube which is not long-term and the user needs to purchase it again for later usage. Shoe-Fix glue is a super glue that has been specially formulated to fix and repair your shoes. The shoe-fix glue has been used for over 30 years by leading shoe shops. 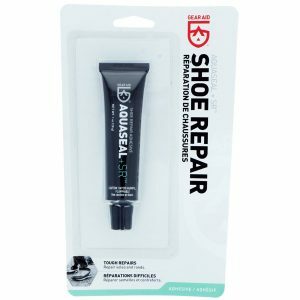 It is one of the most reliable shoe adhesives that repair almost all types of shoes respective to the material. Moreover, the adhesive is so strong that it is ready in a minute and does not require any clamping as well. Unlike any other glue, shoe-Fix glue is thick and not runny. Thus, it fixes well in few seconds and does not require any clamping. It stays intact and does not break or crack over the period of time. The formula used to prepare this super fix glue is years old and has worked over 90% of the materials. The glue is suitable for all types of shoes. Does not require clamping and quickly dries out. Specially formulated to give a permanent lasting. Designed to hold summer heats and icy cold weather. Dries clear. Thus, it is suitable for any colorful shoes. It gives a water-resistant coating to the shoes. Safest glue to use on any shoe, leather, plastic, vinyl or canvas. The only cons of the Shoe-fix are that it comes in a tiny tube as compared to its counter-products. It is not available in all parts of the world. The shoe Goo boots and gloves adhesive is a unique formula designed to repair different surfaces including vinyl, leather, and canvas. The shoe adhesive provides a thick layer of protective coating that increases the lifespan of your footwear and gloves. 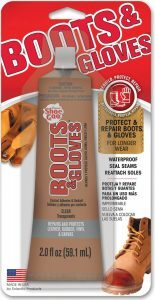 As its name says the shoe goo adhesive repairs and fixes every type of boots and gloves instantly. Best used for giving a protective cover to your boots and gloves. Becomes hard if not kept properly. 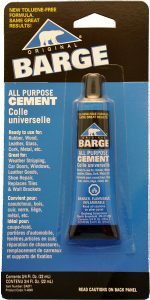 Barge All-purpose cement is a cement base adhesive perfect for outdoor gears. It is a professional strength cemented glue to stick rubber, leather, and wood, glass, and metal surfaces. Barge glue is perfect to hold cotton, wool, and synthetic fabric as well. Stronger than any other cement in the market, Barge All-purpose works as an excellent adhesive to stick your shoes and footwear as well. Since boots come in all types of materials, the cement glue works as an all-purpose glue. One superior flexible bond to stick all types of surfaces. Ideal for a variety of materials. The product is dangerous and may affect the user’s health if not handled properly. It is not suitable for flexible weather conditions. May not last long if the surface is dirty or uneven. Gorilla best glue for shoes is high strength clear adhesive that works aptly to its name. Specially developed to give a long-lasting impact, Gorilla super glue is one of the best glue for household uses. The super glue is crystal clear and is formulated to handle bumps and drops. It sticks not only the sole of shoes but every type of fabrics and surfaces like running shoes. Made out of high-performance cyanoacrylate formal, the product comes in an anti-clog cap and a metal pin inside to ensure maximum reusability. As the name says it all, Gorilla clear grip glue is quick drying glue that gives strong impact, massive duty strength. Enforced with increased impact resistance and strength. The anti-clog cap keeps the super glue from drying out. The fast setting feature dries in 10 to 45 seconds. The gorilla glue is versatile and fixes every surface. Fixes metals, rubber, glass, synthetic, vinyl, and many more surfaces. It requires a thick application. Thinly applied glue does not stick well. When your favorite pair of shoes gets reck, it is tough to throw them away. However, deciding to repair them or replace them entirely depends on the cost incurred. Most of the shoe repair shops use super glues to fix the shoes, which you can also do on your own. They charge double the cost of the adhesive which increases the repairing cost. The super glues formulated to fix your shoes cost lesser than the shoe repairer and give an extended lifespan to your boots. However, it is necessary to know what shoe glue is best for repairs. Always remember it sets best depending on the materials involved. Shoe Goo glue is specially made to be utilized on sneakers. It’ll work on other substances but that’s not its principal objective. It’ll work on bottoms in addition to uppers and all footwear materials like lace, lace, and rubberized. It dries elastic and watertight and is very durable. It’s among the preferred glues for gluing your own sneakers. On the other end Gorilla glue is intended to seal and bond to any kind of material such as footwear materials like rubber, leather and much more. It’s water and temperature resistant, so it may be a bit hard to employ because it expands when implemented and you have to know about any spills or drips which may happen when using it.